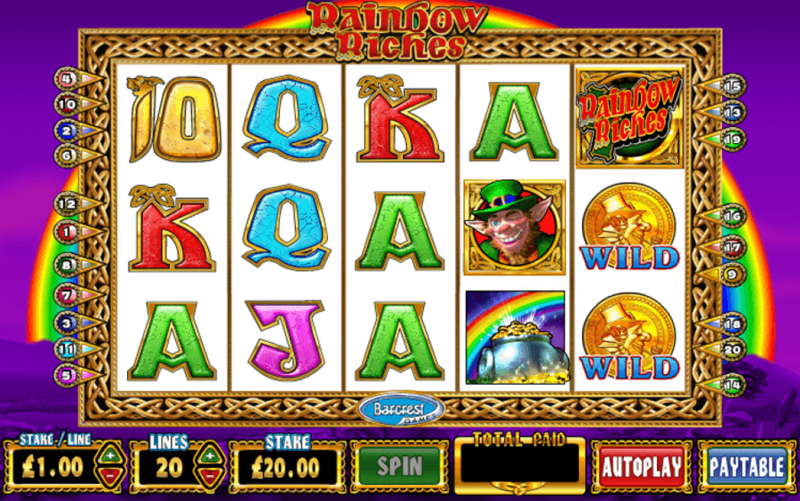 Rainbow Riches is an Irish themed slot and surprisingly there are actually quite a few of these. This one is from the company Barcrest, better known around the pubs of the UK for its actual physical fruit machines rather than its online games. Rainbow Riches is a five-reel slot with twenty paylines available. 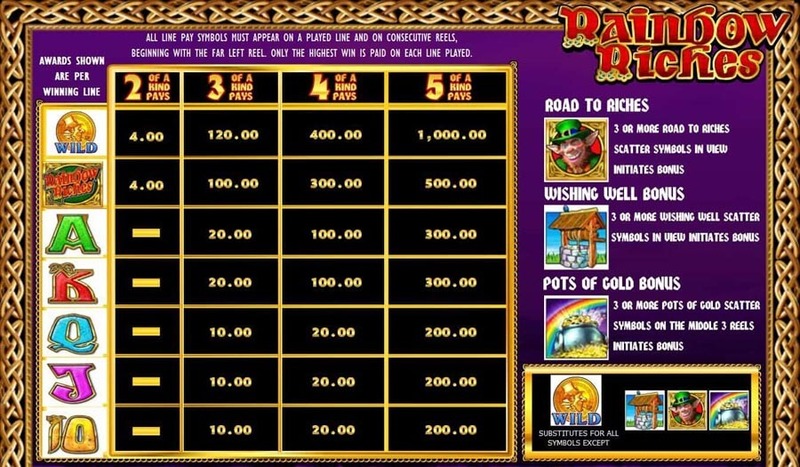 In keeping with the tradition of Barcrest this slot still contains elements of the traditional fruit games, particularly in the bonus games that it offers. Set against a vivid purple sky, a large rainbow encircles the golden reels. 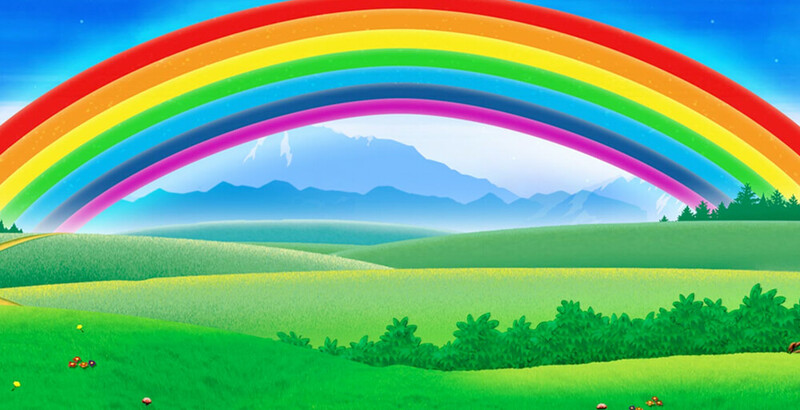 The symbols follow the Irish theme with the Rainbow Riches logo, wishing well, and pot of gold, being some of the symbols. The lower values are simply represented by brightly coloured playing card numbers, 10, J, Q, K and A. A wild is represented by a gold coin and the scatter is a slightly creepy looking leprechaun. of 95% this is not as uncommon as one might think. There are three bonus features in this game, which is perfect for those gamers that enjoy the bonus features of games. Firstly, there is the Road to Riches bonus. This is one of the fruit machine style offerings. To activate this part, players need to land three of the scatter symbols on the reels. The screen then changes to a view of a path with a line of increasingly valuable multipliers and a wheel of fortune. Pressing spin will start the wheel turning and it will land on a number from one to six or the label ‘collect’. Landing on a number will move the player that many spaces down the line and allow a second spin. Landing on ‘collect’ will end the bonus. The final multiplier that the player lands on is simply added to the total stake. Next is the Wishing Well Bonus. A minimum of three wishing well icons must be landed on the reels to start this bonus. Players then need to pick one of the wells and a multiplier will be revealed and this will be used on the player’s total stake. Lastly there is the Pots of Gold Bonus. Players need to land three pots of gold icons on the central three reels. This will change to screen with a leprechaun standing on top of a rock in a large field, circling his head are twelve pots of varying values. One pot will stop at the bottom of the screen above an arrow and this is the prize awarded to the player. Like the other prizes this too is a multiplier and is applied to the stake that the player has been using. 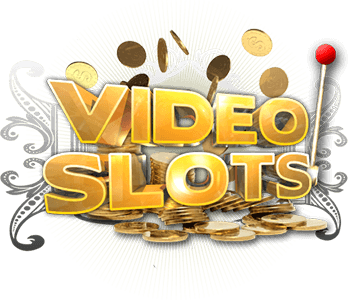 Overall this is a great slot and very popular. Colourful characters and excellent bonuses, all of which get activated regularly, combine to make this a rewarding game.